…especially since it can’t gobble down a piece of poisoned meat by aspiring thieves. No sir, this nifty contraption is proof of the adage “it’s bark is worse than it’s bite”, as it functions as a deterrent to intruders. Simply place indoors anywhere you wish to detect movement, ideal to hide near your front or back door. 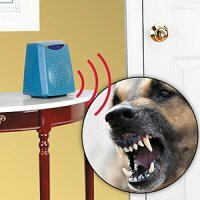 When movement is detected, it barks intermittently and then barks louder and more frequently as an intruder gets closer. Very realistic and very effective. Adjust the distance and volume to your needs. Also use rainforest or chime setting to announce invited guests. I’m not sure if this $99.98 purchase is suitable for homes, since thieves these days are smart enough to scout out a home before they break-in. Surely they’ll know that you’re using a deterrent, and not rearing an actual German Shepherd!